The Director of Photography is the head of the camera dept. 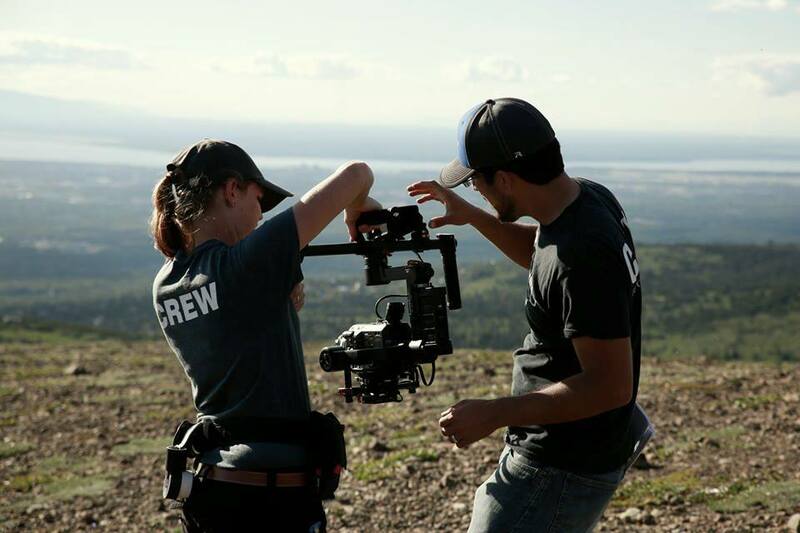 He/she works closely with the Director to craft the visual storytelling of the film. The DP is followed by Camera Operator(s) (often on most smaller productions the DP is the Camera Operator). Then comes the 1st AC. The 1st AC manages the camera package and pulls focus. Last in line is the 2nd AC, they run the slate and in general are the lackey/runner/grip/gopher/whatever-the-rest-of-the-Camera-Team-needs person. On larger productions, this authority structure is rigidly followed. Each team member reports directly to the person above them, however on smaller projects those lines often blur, in favor of a more collaborative atmosphere. On our projects, Alex is typically the DP/ Camera Operator, and I (Amelia) am his 1st AC. Knowing each other so well and working with each other on so many projects has allowed us to have an efficiency in setup and communication. When we’re on set, it is imperative that the camera department moves quickly into a new setup allowing the DP and the Gaffer to see how the light is working on camera; because of our relationship I can anticipate Alex’s decisions and be able to have the camera ready for him as quickly as possible. Alex and I on set doing the work we love. Teamwork can only take you so far, at some point this team also needs top notch gear. One of our favorite pieces of gear is our main monitor, a Small HD AC7. It’s rigged with a Zacuto quick release, for speedy adjustment. We use it on every camera system we set up. Having a monitor that you can trust is very important, both for a DP and an AC. You’ll use it for everything from composing your shots to pulling focus so don’t buy a cheap one. A close second is our array of Pelican Cases. Having all of our gear safe and organized so we know exactly where it is at all times in these hardy cases is incredibly helpful! Amelia keeping our gear in peak condition, ready for the next shot. No matter what department you’re in, nothing beats preparation. How we do pre-pro depends entirely on the production we’re working. A lot of our work is in the documentary and reality tv space so most of our pre-pro is limited to working with the director on a shot list. No matter what department you’re in, nothing beats preparation. If your Pre-Production time is limited, one of the more important things you can do is work with the director to figure out a style and pace for the film. We like to review reference films with directors and discuss elements of the cinematography that we’d like to emulate. This gets everyone on the same visual page and should help things flow smoother on set. Great composition is all about depth and balance. We like to create depth with layers, breaking every shot down into the foreground, middle, and background. You can also create depth with movement, light, and texture. We find it is easiest to create a beautiful shot on a long lens. Creating depth on a wide lens is difficult, there is so much more space to fill. Creating a beautifully balanced wide frame is truly an art. Start simple with a longer lens and take the time to identify the layers of depth in your shots. You can always stretch yourself, widen your lens, and add new elements as you go. It’s all about natural lighting. If you can’t control the light then let it control you. One of the beauties of low budget production is the smaller crew, which can allow you greater flexibility with scheduling. We love to wait until golden hour or dusk. That kind of lighting adds tremendous production value. A cinematographer is only as good as what he or she puts in front of their camera.